We've enthused about Proporta's mobile chargers ever since day one, with capacities rising from just over 1000mAh to 3400mAh, then to 5000mAh and now this, the Turbocharger 7000, at a whopping 7000mAh. In this review, I look at what you get for your money and assess its performance, its build quality and its worth, in terms of keeping smartphones, games consoles and even tablets charged and working. Anecdotally, these chargers have been tremendously popular, one of Proporta's biggest sellers and, whenever I get some in to give away as prizes on the Phones Show Chat podcast, they get picked first on every single occasion. The idea is that you charge up the charger itself from mains or 12V or a USB port and then the charger can dish out power to almost any gadget when needed. At 7000mAh, this Turbocharger can full recharge the Nokia N8 around five times, or the HTC Radar around four times - in each time from scratch, from a nominally empty battery. That's pretty impressive for an 'emergency charger'. 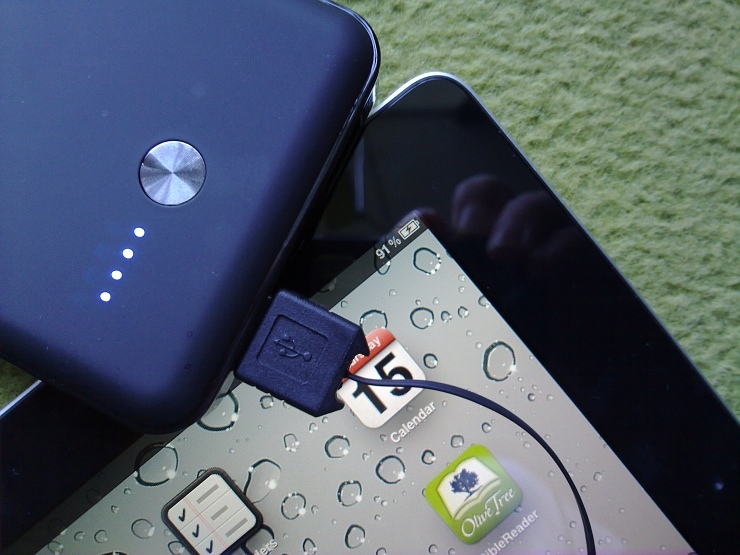 In reality, the main benefit of these portable charge stores is that, through all the ports and tips supplied, you can be your family's salvation on a trip out. Whichever phone needs a top-up, whichever tablet or Nintendo 3DS, just plug it into the Turbocharger 7000 and they're off and running, either using the device live again or letting it recharge as needed. Impressive theory then, but how well does it all work? You get the Turbocharger 7000 itself, finished in Proporta's new trademark rubberised matt black, with rubber feet to stop it slipping on a desk and Proporta logo etched into the back. The plaque on the back states that it can charge at 1A, which means that an empty Turbocharger will take at least 7 hours to fill via microUSB - definitely something to leave on charge the night before a trip, for example. 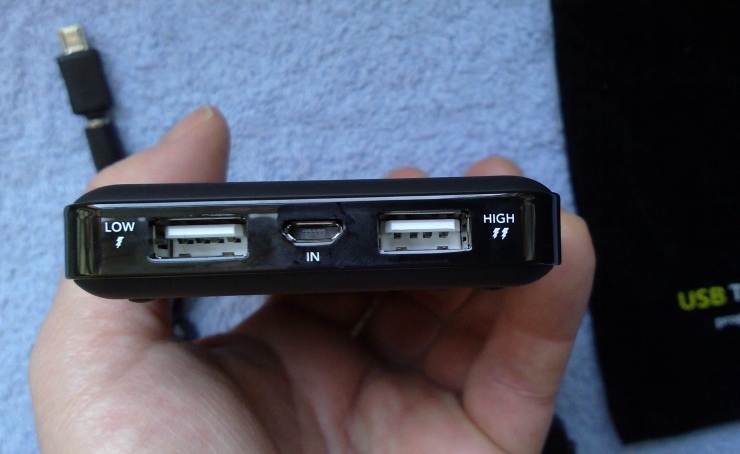 Output is at a maximum of 2.1A, from a combination of output through the two USB ports, shown below. They're labelled as 'High' and 'Low' but, unlike the previous Turbocharger 5000, I suspect that both ports now output the same voltage and maximum current. I tried charging an iPad 2 from the 'Low' port (bottom photo) and it charged just fine. The documentation that comes with the accessory actually refers to the ports as outputting 'high' and 'low' voltages, which is clearly wrong. Having differently labelled ports might perhaps stop a new user trying to charge two iPads simultaneously (which would require between 3 and 4A), but other than that the labelling is confusing and might as well be removed in this Turbocharger incarnation. In each case, you simply plug in and press the central silver button to start charging. 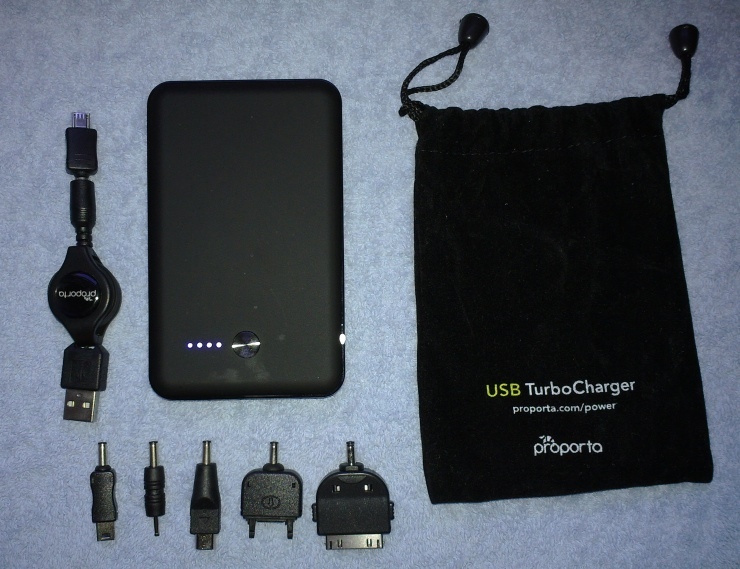 I tried the Turbocharger 7000 with over a dozen gadgets, from a lowly Nokia N82 to the iPad 2 and it worked every time. Proporta supply their familiar spring loaded extensible USB to multi-jack cable. This does work well for a while and stops the usual cable tangles, though over the course of many years, I've had two of these coil-based cables fail on me and I've had to manually prise the coil section part to extract the wire. Still, it's a unique selling point and works well as long as you remember to pull on both ends at the same time, to extract the cable smoothly and evenly. It's worth noting that because the charge all comes from two completely standard USB ports, you can also use any original cables that came with your gadget, should the above choice not suffice or should you want to charge two things at the same time. With the output current on offer here, it's very practical to charge (for example) an iPhone and a Nokia smartphone at full charging throughput, simultaneously. Along similar lines, charging the Turbocharger 7000 itself via USB from a computer (i.e. at 500mA max) doesn't light up the LEDs, so you've no direct confirmation that charging is happening. Happily, plug it into a mains USB charger (pulling the full 1A) and the LEDs do indeed animate. getting a 'lifetime warranty'. In fact, Proporta's own FAQ includes an exception for Turbochargers, stating that warranty is 'two years', presumably trying to stop people coming back after (say) three years of hard use or mis-use, when capacity is down to half, wanting replacements. However, aside from the fact that two years warranty is likely to be plenty for most users, the phrasing of their general support paragraphs implies that if you're not satisfied at any point or have a problem then you should get in touch. Provided Proporta can keep the price competitive, the Turbocharger 7000 package should prove as popular as their existing 3400 and 5000mAh models. When I travel, I now take the TC7000 and a mains-to-USB adapter, for easy restocking of the TC7000 and for direct charging of phones and gadgets should the unthinkable happen and the TC7000 run out of power. Given that 7000mAh is a lot, I've only twice seen the LED indicators on top dip below 'three dots', so it seems that I'm naturally paranoid! Maybe we're unusual, but the others in my family are notoriously terrible at remembering to recharge anything. From phones to game consoles to iPad to laptops, we set off somewhere and "Oh, it's run out of battery"... It may not be able to help with the 'laptop', but for the family man on the move, keeping the Turbocharger 7000 in the glove-box of the car or in a rucksack provides an impressive amount of 'just in case' recharging ability for every other bit of tech we use day to day.